Which questions will Sister ask on her Catholic Confirmation quiz? Here are the main questions and answers! 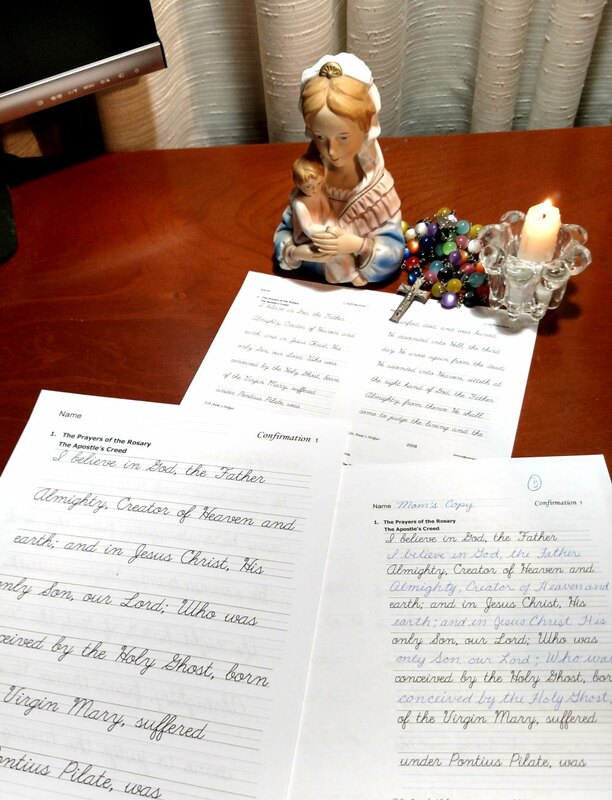 Your kids can practice several ways with Saint Anne's Helper Confirmation worksheets and quizzes. They use the Baltimore Catechism No. 2 questions and answers in Manuscript and Cursive writing worksheets that you can bind in a workbook or use individually as worksheets. Excellent for handwriting class, too! Bonus: Four different printable Confirmation quizzes. 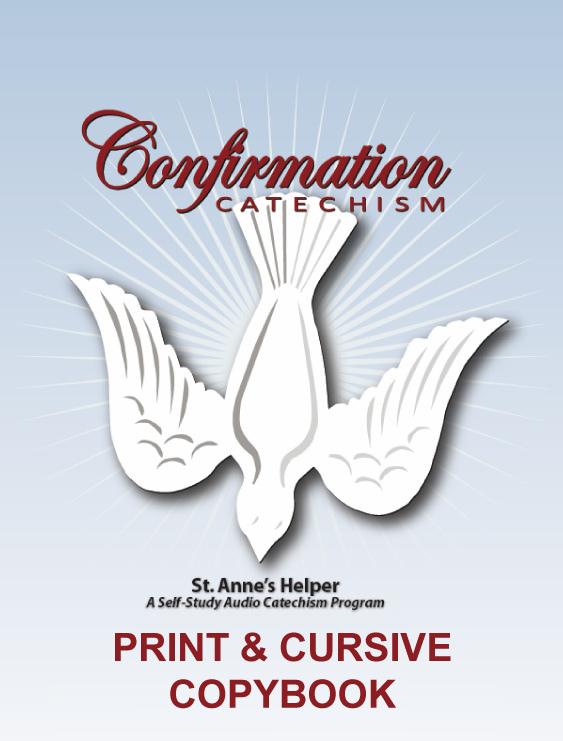 Printable Catholic Confirmation Quiz, manuscript and cursive worksheets. Four 3 page Confirmation quizzes. Print Options: 2nd, 4th, and high school. Catholic Confirmation Quiz Download: printable Confirmation worksheets and quizzes. Four Catholic Confirmation Quizzes and Baltimore Catechism No. 2 worksheets. Print in three sizes, both cursive and manuscript.Click to enlarge. The Catholic Answers to the Baltimore Catechism No. 2. No wondering if your student is being misled by fluff. No NSJBC here. Giant Money Savings. Once you own these you have permission to print off as many writing worksheets as you need. For as many students or years as you need. Flexibility. You can print the whole catechism copybook on predrilled 3-holed paper for use in a binder; spiral bind the set at an office supply store (email them the job! ); and/or use them as printable worksheets, busy work or review. Catechism Copybook samples (above) give you an idea of how useful St. Anne's Helper Copybooks can be. You can print as many copies as you need throughout many years. Print these pages and bind them as a book. Use your own binder or email it to an office supply store to be spiral bound. Print them on three holed paper to use in a binder. Print them on low weight paper so they fit nicely in a folder. Print them as penmanship practice sheets and use them to review manuscript and cursive writing skills. Use them as printable Confirmation worksheets to review the Baltimore Catechism. Various Handwriting Grade Levels. New section with ideas for older students. Fill in the blank, answer key, and essay quizzes. Once your students have memorized the Baltimore Catechism answers for Confirmation; copying the text helps them to be able to learn to spell the words well. These are also great for the years between sacraments, what better review than preparation for Confirmation? 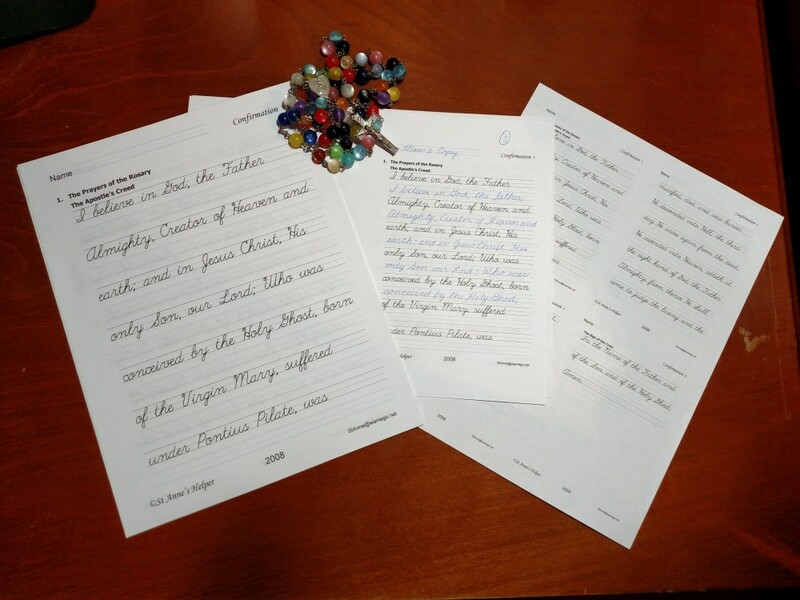 Rewriting the answers on these Catholic handwriting worksheets gives handwriting practice which improves penmanship, too. I have seen students that who struggled to read, simply continue to write the words and learn the phonograms as they copy these timeless truths. Copywork can really improve reading skills for some children. The extra copywork forms good habits and makes the words easier to recognize. 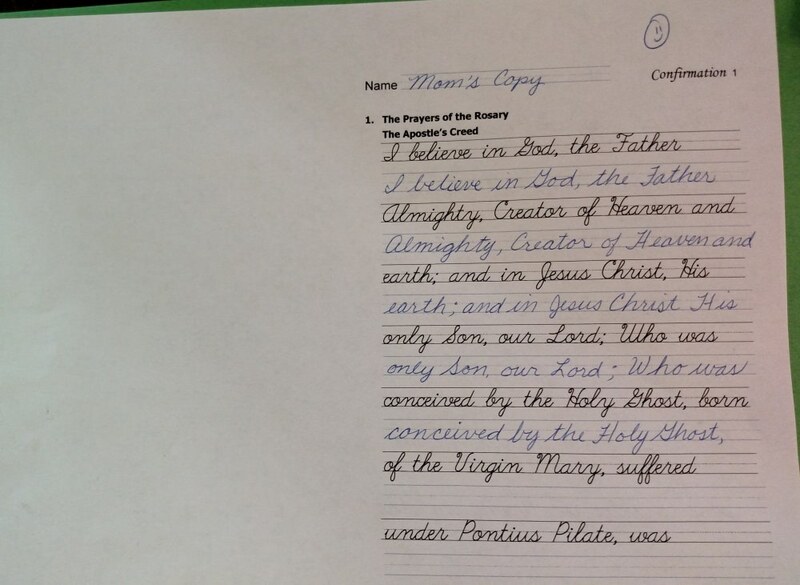 Using Catholic catechism copybook sheets as worksheets individually and with dictation-style teaching gives explicit instruction as to what the words say. This can really boost reading and writing skills for all other courses of study - all on great material! Try practicing the Hail Mary or Our Father several times and find how many words young students learn to read easily. When you are busy with other students, extra pages can be printed as extra work for students who are finished early. This is very handy for homeschool when unsupervised work or busy work is needed to keep busy minds and hands busy. Since these pages are reproducible, you can choose to print the specific page that you need from the catechism copybook downloads. Perhaps your children are learning the Our Father. 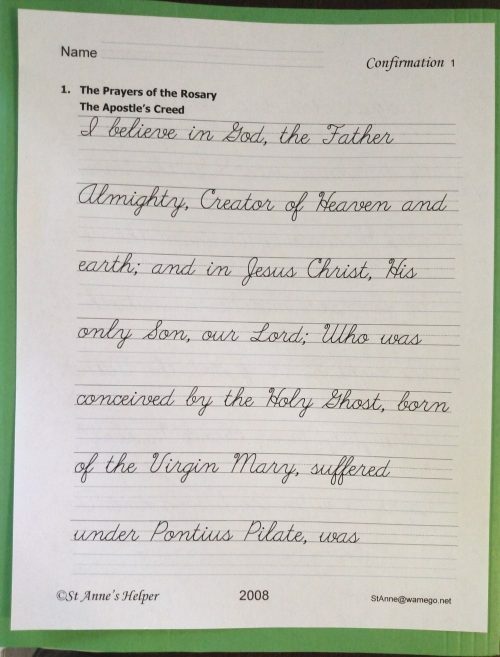 Well, they can copy the prayer for catechism and penmanship. These worksheets can be printed over and over for special questions like the Ten Commandments and the Confirmation prayers. This way pages can be reprinted for extra practice on a particular answer. Idea: Use pre-drilled three-hole punched paper that can be written on and placed in a special binder for the purpose. A spiral binding at an office supply store can remove the need and the hassle of using a binder (losing worksheets anyone?). The spiral bound book seems more special when it is spiral bound and it is less cumbersome to write in it. It is easier to keep all of the work together, too. The whole copybook can be printed and bound for a keepsake practice book. Even our high school children like these. They especially like the effect of printing them 2 up for a small and elegant font. See below. You can print these worksheets in several sizes depending on the grade level of your students. Small children sometimes do well with larger fonts, yet older students love the small small font. Small, medium, large. Your choice. 1. Full Sized Worksheets: Simply print full sized and double sided if you'd like to save paper. This is great for first, second, and third grade catechism work. Awesome preparation for a Catholic Confirmation quiz. 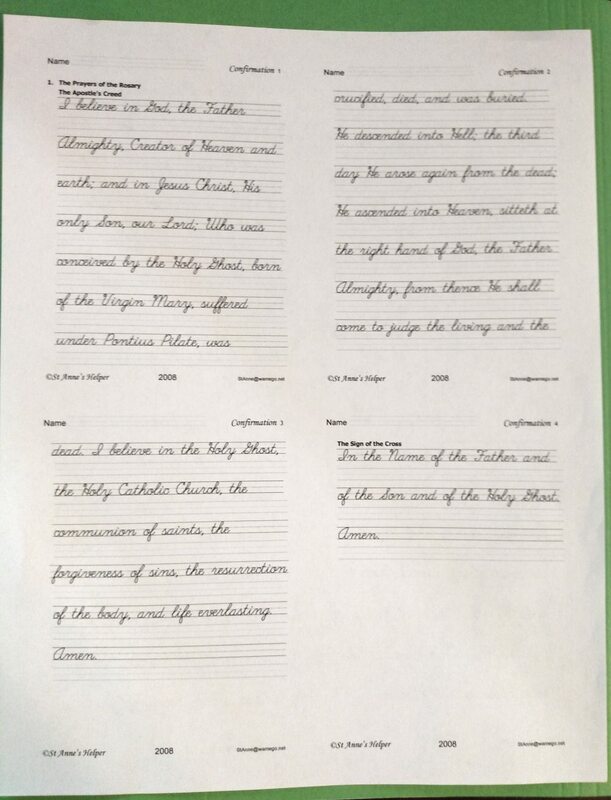 Baltimore Catechism Worksheets: Large Font printed full sized. 2. Booklet: Your older children will love this as handwriting practice if you print the download as a booklet. Great for third through eighth grade penmanship. Use thin paper because 23 pieces of paper is hard to fold and staple. You can also sew or zip-tie these together. Print two up for middle school handwriting practice size. Baltimore Catechism Worksheet: Medium font, print two-up. 3. Small Font Worksheets: You can also get your printer to print this download two up so that the questions will be in consecutive order (ask me why I do that - it's so confusing to the children if the questions are in scrambled order on individual booklet sheets). You can chose Multiple, 2 by 1, horizontal, and landscape orientation for a middle school font. 4. Elegant Handwriting Worksheets: For even smaller print you can print these Multiple, 2 by 2, horizontal, and portrait orientation. This looks super elegant! Part of the secret of beautiful writing is control of the pen and a small size. 'Perfect for high school handwriting practice and saves ink and paper. Baltimore Catechism Worksheets: Small font, print four up. 5. Typing Practice: You can also copy the text file to your students' files so they can practice typing. What better than the Baltimore Catechism for learning to use the keyboard? Four different 3-page quizzes where the questions are in different order. Use each page as a separate quiz, or open book practice. Use them as a cumulative review or test. Page 1 covers the Ten Commandments, the precepts of the Catholic Church, and the Holy Days of Obligation for all four sets. Page 2 covers many questions about the Blessed Trinity, the Gifts of the Holy Ghost, and Jesus Christ. This page varies with each of the four sets. Page 3 covers chief teachings about the Catholic Church: Jesus Christ, His nature, Redemption, definitions of Baptism and Confirmation and the effects of Confirmation. We're including this useful treasure for free, keeping our price the same as it has been for years. You have our prayers that your children score well on their next Catholic Confirmation quiz! Have an audio learner? You'll love our Audio Confirmation download. Find a handy little printable Confirmation Preparation ebooklet here. Or see below.